Our network analyzers for wired and wireless networks, CommView and CommView for WiFi, include a VoIP analysis module that is suited for real-time capturing and analyzing Internet telephony (VoIP) events, such as call flow, signaling sessions, registrations, media streams, errors, etc. By visualizing this data and assessing voice quality, this tool helps you boost productivity in debugging VoIP networks, software, and hardware. CommView's VoIP analyzer supports SIP 2.0 and H.323 signaling protocols and RTP 2.0 media streams and many widespread codecs. 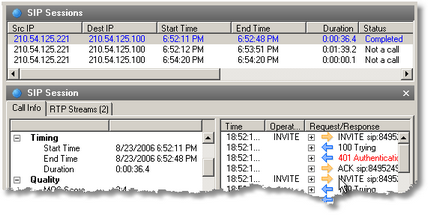 In addition to real-time analysis, the analyzer can be used for post-capture import and analysis of capture logs in a number of formats. Real-time and post-capture analysis of signaling sessions and RTP streams. Seeing the details of every VoIP call allows identifying and resolving connectivity problems on the networking and protocol levels. Call details include source and destination IP addresses, time of the beginning and end of a conversation, call duration, call status, quality score, user agent types, as well as additional, protocol-specific details such as authentication information and codec types. Visualization of call quality. Watch the charts and diagrams to understand the quality problems that may affect your VoIP network: packet loss, jitter, or sequence errors. Monitor MoS and R-factor for every call. Actual call playback. The MOS and R-Factor do not tell the whole story about the quality of a particular VoIP system. 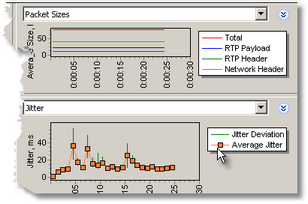 These measurements are merely suggested baseline points for expected call quality in a VoIP deployment. The ability to play back actual conversations is essential for successful VoIP deployments. VoIP analyzer provides the means to record and play back calls to assess voice quality by simply listening to the voice. Endpoints. Heterogeneous VoIP networks may have multiple types of endpoints with varying degrees of compatibility with the VoIP server and between each other. CommView's VoIP analyzer identifies and displays the model names of endpoint devices, allowing tracking down connectivity problems and often fixing them with a simple software or firmware update without hunting around the network. Bandwidth utilization. Being able to see network bandwidth utilization in real-time is essential for understanding the difference between the optimum and current environment, often enlightening network administrators that a simple traffic shaping can essentially increase the quality of the calls transferred over that network. Reporting and logging. Reporting and logging provide benefits of greater statistics samples, better usability, and visibility of essential issues. To evaluate our VoIP analyzer, be sure to download 30-day trial versions of CommView or CommView for WiFi. For more information on VoIP basics, guidelines on efficient monitoring and analyzing VoIP network traffic, and troubleshooting various VoIP problems, please refer to our white paper, Monitoring and Troubleshooting VoIP Networks with a Network Analyzer, available in PDF and online formats.